Jackfruit Taco With Portobello Mushroom . I had never even heard of jackfruit until a few weeks ago–it has a weird name, and seemed like a food that could only be used as a fruit. I was so pleasantly surprised to find out that jackfruit can be used in a main dish, and is actually delicious. Fun Fact: it is a species of the mulberry and fig trees and is rich in protein, potassium, calcium, and iron How yum is that? 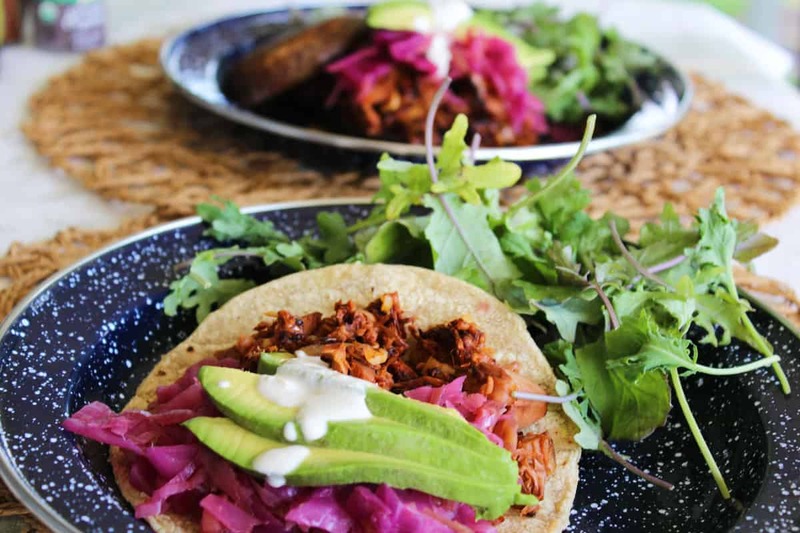 We made jackfruit tacos with both corn tortillas and portobello mushroom buns. Amazingly, they were delicious and we felt like we had had a gourmet meal. 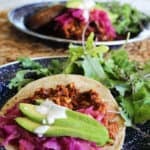 Jackfruit Tacos on corn tortillas or portobello mushrooms. Yum. Add tomatoes, maple syrup, spices and sriracha sauce and simmer for 30 minutes. Pull jackfruit apart with fork. I added pickled cabbage and avocado to grilled corn tortillas and the jackfruit and topped with cashew garlic sauce. I also grilled a portobello mushroom bun and added the same ingredients.